Tue, Jul 10, 2018, 09:30 pm SL Time, ColomboPage News Desk, Sri Lanka. July 10, Colombo: The Sri Lanka Embassy in Seoul, in association with the Sri Lanka Export Development Board (SLEDB) participated in the Seoul Import Goods Fair 2018 organized by the Korea Importers Association (KOIMA) from 21 to 23 June at COEX Convention and Exhibition Center in Seoul. 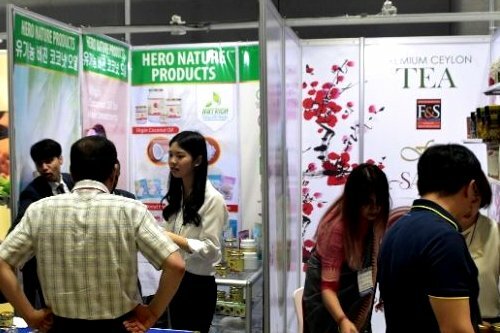 Ceylon Biscuits, Hero Nature Products, Euro Asia Corporation and Ceylon Catch exhibited their products at the Fair displaying biscuits and snacks, organic virgin coconut oil products, Ceylon tea and seafood, respectively. Sri Lankan companies also had several B2B meetings arranged by the Sri Lanka Embassy and KOIMA. 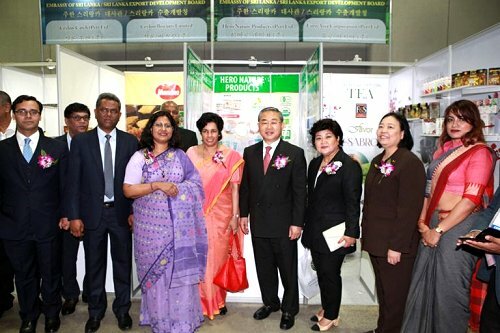 KOIMA Chairman Shin Myoung-jin, other Korean dignitaries and the diplomatic corps joined Sri Lanka's Ambassador Manisha Gunasekera in visiting the Sri Lankan stalls. Sri Lanka's participation was facilitated by the Commercial Section of the Embassy under the leadership of Minister Commercial Jagath Abeywarna.